Movies were still new in 1914, and they didn’t have credits, but audiences were becoming obsessed with their favorite stories, players, and directors. Some alert journalists and gossip columnists were catching on to the existence of a new nobility of actors and stars that could be exploited for public interest, hence the rise of fan magazines. I ran across this example of a century fanzine a few months ago, and have taken some time to peruse its contents before reporting back. My impression is that this was intended for a comfortably middle-class white audience, and it’s infused with a number of efforts to suggest ways that the motion pictures are (or could be) socially beneficial. A lot of what you’ll find here are depictions, caricatures, and drawings of the named stars themselves. John Bunny (we’ll see some of his movies later this week) is still big, even though Chaplin and Arbuckle seem like the important comedians of that year to us now. Mabel Normand is another recognizable face, and we also see Lillian Gish and Henry B. Walthall, but a lot of the names and faces have since faded, making this an interesting document for historical study. A number of the “articles” are in fact plot summaries of films in release – sort of the first novelizations, I suppose. In that vein, we get “The Ethics of the Profession,” “The Hand of Horror,” “The House of Darkness,” “Cast Adrift in the South Seas,” “Neptune’s Daughter,” “Captain Alvarez,” and “The Song in the Dark.” I also found interesting the articles on the different “types” of moving picture audiences “good and bad” motion picture theaters and the suggestions for what the next improvement for films should be. Here’s a hint: no one says “sound,” but one commenter does call for the addition of credits! 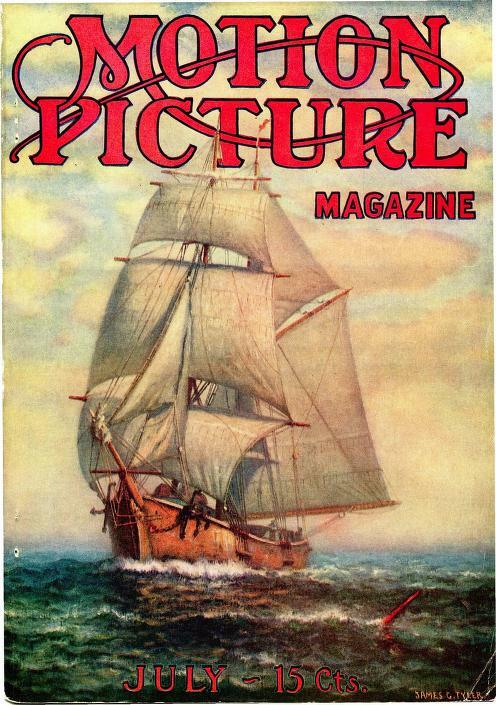 Motion Picture Magazine’s July 1914 issue is available for free: here.